City has no rules on preserving number of single-room-occupancy rooms as investors eye micro-apartments and beer gardens. 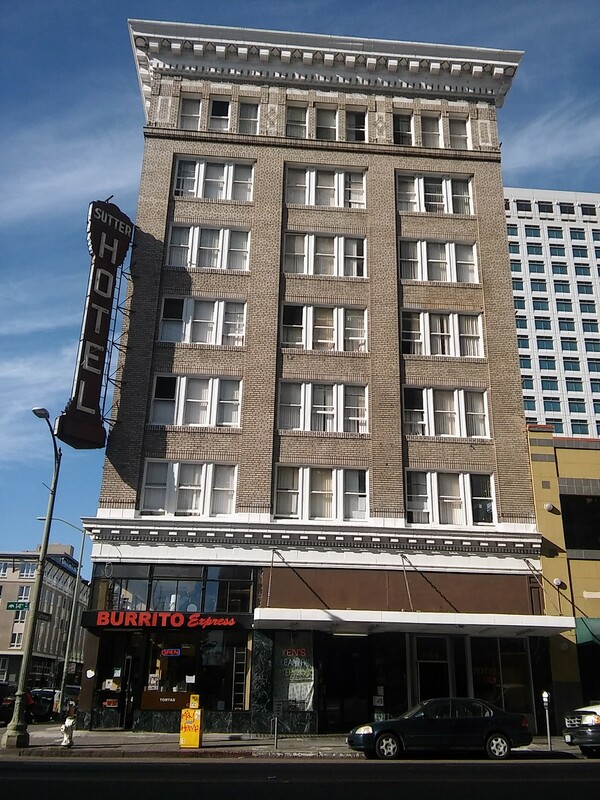 The Sutter Hotel, one of Oakland's few remaining single-room-occupancy hotels, is reportedly being sold to a San Francisco boutique hotel developer. The potential sale of the Sutter — which serves very-low income people, many of them on the verge of homelessness — follows the recent sale of two other downtown Oakland SROs to investors, who plan to push out existing tenants and turn the properties into market-rate apartments or upscale tourist hostels. Despite this imminent threat to more than 1,000 existing affordable housing units clustered around downtown and West Oakland, city officials have been slow to take action. Unlike San Francisco and Los Angeles, Oakland currently has no policy in place to prevent the loss of SRO housing, and funds to renovate the buildings are virtually nonexistent. 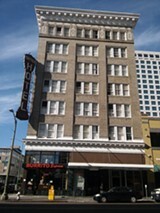 In a May 6 email obtained by the Express, Alicia Parker of the Oakland planning department wrote to several fellow city staffers that Rebecca Bunya, one of the co-founders of Yang Capital, a San Francisco investment company, "is in the process of purchasing the Sutter Hotel (14th and Jefferson streets) and wants to convert [the Sutter] to a boutique hotel." Parker asked her colleagues whether any of them would be "interested in meeting with [Bunya] to guide her through this or to possibly discuss alternative options with her?" Parker told the Express that Yang Capital asked city staff to explain Oakland's rules with respect to the preservation and conversion of SRO housing but said the city isn't working with investors who want to convert SROs into boutique hotels. When reached by phone on Monday, Stephen Yang of Yang Capital said he couldn't discuss whether or not his company is in contract to purchase the Sutter Hotel. An email to the Sutter Hotel's current owner, Raj Singh, went unreturned. But Yang visited the 102-room Sutter Hotel on Monday and was given a tour of the hotel by Dion Ross, a self-described "project implementation strategist," who said in an interview that he was hired by Singh to quietly market the building to potential buyers. Ross told the Express that he has shown the Sutter Hotel to seven prospective buyers in recent weeks. Ross is also employed by Danny Haber, a San Francisco-based investor who purchased the Hotel Travelers, another of Oakland's downtown SROs, in February. Haber has reportedly been buying out existing tenants and has announced plans to build a beer garden on the hotel's roof and rent refurbished hotel rooms out to tourists at more than double existing prices, according to current residents. Another downtown SRO, the 38-unit Fremont Hotel at 524 Eighth Street, occupied mostly by elderly Chinese residents, was sold last October to investor James Kilpatrick, who told the business press that he plans to renovate, raise rents, and replace the existing residents with tech workers and students. Housing advocates say that SROs serve an important purpose. They are the housing of last resort for vulnerable populations. And as SROs disappear, the number of homeless people living under freeways or bridges will likely increase. Despite filling this crucial role in Oakland's housing market, the city currently has no regulations preventing the loss of SRO housing. As a result, Oakland has lost nearly half of its SRO stock over the past twelve years. According to a September 2015 city report, Oakland had 31 SRO hotels with 2,285 rooms in 2004. Over the years, several buildings were demolished to make way for new developments, leaving only 1,311 SRO units in Oakland today. Now, there's pressure from investors looking to capitalize on rising rents and Oakland's nascent reputation as a hip destination. "As Oakland gentrifies, rumors have spread about investors making plans to renovate residential hotels in order to market them to wealthier customers," the city report states. "Sutter Hotel management has also expressed to city staff their interest in converting their building to upscale apartments. While other cities have adopted ordinances to preserve SROs as low-income housing, Oakland currently has no such laws on the books." Elisa Dennis, an affordable-housing consultant with Community Economics, said that while the city's official policy is to preserve existing affordable housing, there isn't enough money available to do it. "For a long time there weren't market pressures," she explained. "The loss of these SROs, it's yet one more nail in the coffin for Oakland's most vulnerable," Dennis said. "There's this flurry of investor activity, and nowhere else for people to go."